Mind the Gap: Can Inbound Do It All? Inbound marketing delivers, but it’s vital to measure cost-per-lead and conversion rates to truly understand this marketing mode’s contribution to the bottom line. Careful inbound analysis reveals significant gaps that clearly show it’s not a stand-alone tactic. A well-run inbound program realistically delivers 35% of the leads an enterprise needs to meet its numbers. Nurturing those inbound leads using a multi-touch, multi-media (phone, voicemail, email), multi-cycle approach boosts the lead rate an additional 11%. Including outbound in the marketing mix assures your organization generates the additional 54% of new business needed to achieve revenue goals. To mind the gap and assure your pipeline is consistently filled with qualified opportunities requires a carefully designed “allbound” lead-generation program that embraces inbound, nurturing and outbound to optimize revenue. 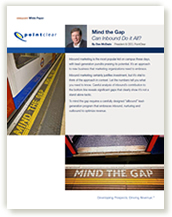 To learn more, download Mind the Gap: Can Inbound Do it All? today.